Parashurama (Sanskrit: परशुराम, IAST: Paraśurāma, lit. Rama with an axe) is the sixth avatar of Vishnu in Hinduism. Born as a brahmin, Parshuram carried traits of a Kshatriya and is often regarded as a Brahmin-Kshatriya. He carried a number of Kshatriya traits, which included aggression, warfare and valor; also, serenity, prudence and patience. He, along with only Hanuman and Indrajit, is considered to be one of the very few Atimaharathi warriors ever born on Earth. Like other incarnations of Vishnu, he was foretold to appear at a time when overwhelming evil prevailed on earth. The Kshatriya class, with weapons and power, had begun to abuse their power, take what belonged to others by force and tyrannize people. Parashurama corrects the cosmic equilibrium by destroying these Kshatriya warriors. He is also referred to as Rama Jamadagnya, Rama Bhargava and Veerarama in some Hindu texts. He is worshipped as the mool (primordial) purusha by Niyogi Bhumihar Brahmin, Chitpavan Brahmin, Tyagi, Mohyals, Anavil and Nambudiri Brahmin communities. Parashurama by Raja Ravi Varma. 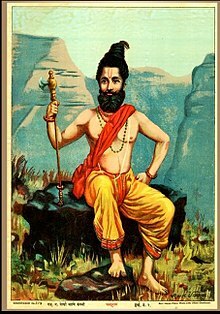 According to Hindu legends, Parashurama was born to a saraswat Brahmin sage Jamadagni and his wife Renuka, living in a hut. They have a celestial cow called Surabhi which gives all they desire (such a cow is known as kamdhenu)..A king named Kartavirya Arjuna (not to be confused with Arjuna the Pandava)[note 1] – learns about it and wants it. He asks Jamadagni to give it to him, but the sage refuses. While Parashurama is away from the hut, the king takes it by force. Parashurama learns about this crime, and is upset. With his axe in his hand, he challenges the king to battle. They fight, and Parushama kills the king, according to the Hindu History. The warrior class challenges him, and he kills all his challengers. The legend likely has roots in the ancient conflict between the Brahmin varna (class), with religious duties, and the Kshatriya varna, with warrior and enforcement roles. In some versions of the legend, after his martial exploits, Parashurama returns to his sage father with the Surabhi cow and tells him about the battles he had to fight. The sage does not congratulate Parashurama, but reprimands him stating that a Brahmin should never kill a king. He asks him to expiate his sin by going on pilgrimage. After Parashurama returns from pilgrimage, he is told that while he was away, his father was killed by warriors seeking revenge. Parashurama again picks up his axe and kills many warriors in retaliation. In the end, he relinquishes his weapons and takes up Yoga. In Kannada folklore, especially in devotional songs sung by the Devdasis he is often referred to as son of Yellamma. Parasurama legends are notable for their discussion of violence, the cycles of retaliations, the impulse of krodha (anger), the inappropriateness of krodha, and repentance. According to Madeleine Biardeau, Parasurama is a mythical character constructed in ancient Hindu thought as a fusion of contradictions, possibly to emphasize the ease with which those with military power tend to abuse it, and the moral issues in circumstances and one's actions, particularly violent ones. In chapter 3.33 of the Mahabharata, he is the grandson of Satyavati, and the son of princess Renuka after she marries a Vedic scholar living in a forest. In chapter 6 of the Devi Bhagavata Purana, he is born from the thigh with intense light surrounding him that blinds all warriors, who then repent their evil ways and promise to lead a moral life if their eyesight is restored. The boy grants them the boon. In chapter 4 of the Vishnu Purana, Rcika prepares a meal for two women, one simple, and another with ingredients that if eaten would cause the woman to conceive a son with martial powers. The latter is accidentally eaten by Renuka, and she then gives birth to Parashurama. In chapter 2 of the Vayu Purana, he is born after his mother Renuka eats a sacrificial offering made to both Rudra (Shiva) and Vishnu, which gives him dual characteristics of Kshatriya and Brahmin. Parashurama is described in some versions of the Mahabharata as the angry Brahmin who with his axe, killed a huge number of Kshatriya warriors because they were abusing their power. In other versions, he even kills his own mother because his father asks him to and claims she had committed a sin by having lustful thoughts after seeing a young couple frolicking in water. After Parasurama obeys his father's order to kill his mother, his father grants him a boon. Parasurama asks for the reward that his mother be brought back to life, and she is restored to life. Parasurama remains filled with sorrow after the violence, repents and expiates his sin. The region of Konkan is considered as Parashurama Kshetra. The ancient Saptakonkana is a slightly larger region described in the Sahyadrikhanda which refers to it as Parashuramakshetra (Sanskrit for "the area of Parashurama"). There is a Parshuram Kund, a Hindu pilgrimage centre in Lohit district of Arunachal Pradesh which is dedicated to the sage Parashurama. Thousands of pilgrims visit the place in winter every year, especially on the Makar Sankranti day for a holy dip in the sacred kund which is believed to wash away one's sins. The Hindu literature on iconography such as the Vishnudharmottara Purana and Rupamandana describes him as a man with matted locks, with two hands, one carrying an axe. However, the Agni Purana portrays his iconography with four hands, carrying his axe, bow, arrow and sword. The Bhagavata Purana describes his icon as one with four hands, carrying his axe, bow, arrows and a shield like a warrior. Though a warrior, his representation inside Hindu temples with him in war scenes is rare (the Basohli temple is one such exception). Typically, he is shown with two hands, with an axe in his right hand either seated or standing. ^ The Mahabharata includes legends about both Arjuna, one is dharmic (moral) and other adharmic (immoral); in some versions, Arjuna Kartavirya has mixed moral-immoral characteristics consistent with the Hindu belief that there is varying degrees of good and evil in every person. ^ The Sanskrit epic uses multiple names for Parashurama in its verses: Parashurama, Jamadagnya, Rama (his name shortened, but not to be confused with Rama of Ramayana), etc. ^ These texts also state that Parasurama lost the essence of Vishnu while he was alive, and Vishnu then appeared as a complete avatar in Rama; later, in Krishna. ^ a b c d e James G. Lochtefeld (2002). The Illustrated Encyclopedia of Hinduism: N-Z. The Rosen Publishing Group. pp. 500–501. ISBN 978-0-8239-3180-4. ^ a b c Constance Jones; James D. Ryan (2006). Encyclopedia of Hinduism. Infobase Publishing. p. 324. ISBN 978-0-8160-7564-5. ^ a b c Julia Leslie (2014). Myth and Mythmaking: Continuous Evolution in Indian Tradition. Taylor & Francis. pp. 63–66 with footnotes. ISBN 978-1-136-77888-9. ^ a b c d e f g Lynn Thomas (2014). Julia Leslie, ed. Myth and Mythmaking: Continuous Evolution in Indian Tradition. Routledge. pp. 64–66 with footnotes. ISBN 978-1-136-77881-0. ^ a b c d e Thomas E Donaldson (1995). Umakant Premanand Shah, ed. Studies in Jaina Art and Iconography and Allied Subjects in Honour of Dr. U.P. Shah. Abhinav Publications. pp. 159–160. ISBN 978-81-7017-316-8. ^ a b Cornelia Dimmitt (2012). Classical Hindu Mythology: A Reader in the Sanskrit Puranas. Temple University Press. pp. 82–85. ISBN 978-1-4399-0464-0. ^ Thomas E Donaldson (1995). Umakant Premanand Shah, ed. Studies in Jaina Art and Iconography and Allied Subjects in Honour of Dr. U.P. Shah. Abhinav Publications. pp. 161–70. ISBN 978-81-7017-316-8. ^ Freda Matchett (2001). Krishna, Lord Or Avatara?. Routledge. pp. 206 with note 53. ISBN 978-0-7007-1281-6. ^ Thomas E Donaldson (1995). Umakant Premanand Shah, ed. Studies in Jaina Art and Iconography and Allied Subjects in Honour of Dr. U.P. Shah. Abhinav Publications. pp. 160–161. ISBN 978-81-7017-316-8. ^ Ganguly KM (1883). "Drona Parva Section LXX". The Mahabharata of Krishna-Dwaipayana Vyasa. Sacred Texts. Retrieved 15 June 2016. ^ a b Daniel E Bassuk (1987). Incarnation in Hinduism and Christianity: The Myth of the God-Man. Palgrave Macmillan. p. 30. ISBN 978-1-349-08642-9. ^ Kisari Mohan Ganguli (1896). "Mahabaratha, Digvijaya yatra of Karna". The Mahabharata. Sacred Texts. Retrieved 11 June 2015. ^ Lynn Thomas (2014). Julia Leslie, ed. Myth and Mythmaking: Continuous Evolution in Indian Tradition. Routledge. pp. 66–69 with footnotes. ISBN 978-1-136-77881-0. ^ Lynn Thomas (2014). Julia Leslie, ed. Myth and Mythmaking: Continuous Evolution in Indian Tradition. Routledge. pp. 69–71 with footnotes. ISBN 978-1-136-77881-0. ^ Thomas E Donaldson (1995). Umakant Premanand Shah, ed. Studies in Jaina Art and Iconography and Allied Subjects in Honour of Dr. U.P. Shah. Abhinav Publications. pp. 174–175. ISBN 978-81-7017-316-8. ^ Thomas E Donaldson (1995). Umakant Premanand Shah, ed. Studies in Jaina Art and Iconography and Allied Subjects in Honour of Dr. U.P. Shah. Abhinav Publications. pp. 170–174. ISBN 978-81-7017-316-8. ^ Chandra, Suresh (1998). Encyclopedia of Hindu Gods & Goddesses. Sarup & Sons. p. 376. ^ "Thousands gather at Parshuram Kund for holy dip on Makar Sankranti". The News Mill. Retrieved 2017-01-13. ^ a b Thomas E Donaldson (1995). Umakant Premanand Shah, ed. Studies in Jaina Art and Iconography and Allied Subjects in Honour of Dr. U.P. Shah. Abhinav Publications. pp. 178–180. ISBN 978-81-7017-316-8. ^ Thomas E Donaldson (1995). Umakant Premanand Shah, ed. Studies in Jaina Art and Iconography and Allied Subjects in Honour of Dr. U.P. Shah. Abhinav Publications. pp. 182–183. ISBN 978-81-7017-316-8. KM, Ganguly (2016) . The Mahabharata of Krishna-Dwaipayana Vyasa (Drona Parva Section LXX ed.). Sacred Texts. Mackenzie, Donald A. Indian Myth and Legend. Sacred Texts.